« ‘In Transition’: now available to view, in full, free, online! Transition Network is delighted to be able to present the first in an occasional series of pdf. 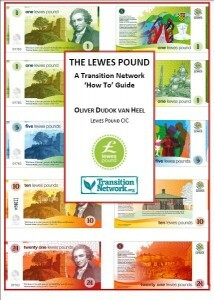 only ‘How to’ guides, focusing on the experience of the Lewes Pound, and how to set up a similar scheme. Written by Oliver Oliver Dudok van Heel, one of the scheme’s founders, it is a clear and concise guide, a delicious taster for Pete North’s ‘Local Money’, (the second in the ‘Transition Books’ series, after ‘Local Food’) due out in March. To help us cover the costs of its production, we’d really appreciate donations along the lines of what you think it is worth to you and how helpful you found it. You can download the guide here, and make donations via the button below. We hope you find it useful. Hi Eva… will check on Monday, and post it here.. thanks! Jct: I wish there were time for me to check whether they link their currency to time and if they teach any fatal flaws. The donate button doesn’t appear to be working. Jct: it is not in any way linked to time. It works like Berkshares. Its a nice first step towards more radical/ empowering community/ complementary currencies, and helps raise awareness of some important issues, but being linked to sterling doesn’t actually generate and new currency for the local economy (it merely helps circulate a small portion of the money in the area around the local economy a little bit more before it is traded back into sterling and leaves again). Still, great work in my opinion. PS – by being linked to sterling I mean that the only way to get hold of some Lewes Pounds is to purchase them with sterling. They are basically a local gift voucher. Tom Greco’s book The End of Money and the Future of Civilisation can be purchased through Living Economies Educational Trust http://www.le.org.nz. We also have a huge range of books, dvds and other resources about complementary currencies.